R Star Foundation, “Women Helping Women & children in Nepal”, started in 2003 by creating a beginning solution for the poorest of villages in the district of Kavre, Nepal which has always been a communist dominated district. We started with money for 89 goats; we were able with collaborations at Nepal’s federal level to get sufficient help to actually give 200 goats to 2 diverse villages with a ‘pay it back’ program to those we gift. Since 2003 our program is attributed to over 15,000 goats with our original gifting. Microfinancing was established per group of 25 women, which all seed amounts grew 1800% in a couple of years, and all up about 500% in the first year. (They keep the 10% interest now charged for the loans as long as they hold the rules. The loans otherwise available to the rural villages were as high as 185%, 155% being considered ‘good’). In 2008 we opened a school TOW-Nepal (Top of the World-Nepal), in addition to traditional Nepali studies, we teach peace for 20 minutes a day by programs created by Rosalind and expanded by an intern from SOKA University. Student created peace flags are sent to Nepal by American students who learn of our work by our presentations; in return, our TOW-N students create peace flags as part of their fun part of learning, which Rosalind brings to the USA. The villagers and other government schools are now joined in our peace efforts. Our above average students teach peace to the government schools, which adds to our reach to peace in a long standing warring area. Our reach to teach peace extends to the adults as children return home and share what they are doing as children do… thus teaching peace in ways we cannot! We scholarship the females to school or they would not be permitted to attend, since girls are a lesser value to this day, their parents would not otherwise allow them to attend. The boys pay only half the usual fee of government schools to attend ours. The benefit to all is the children remain in the village without the perils of being attacked by tigers, vipers, weather or two-legged predators for heinous activities. 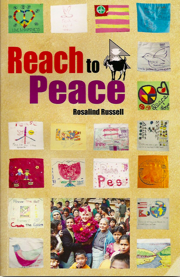 To assist others in knowing about the peace program, Rosalind wrote the little book REACH TO PEACE to share our efforts our world craves. Added recently to the school is a hanging garden which shows another way in small spaces to grow a variety of plants or flowers; we are bringing Kindles fully loaded for the students, bringing them closer to what we all know in electronics. Additionally by collaborations for Nepal, we have graduated nearly 2000 women from literacy classes, which the villagers love and ask for more classes. Read more on the website to learn of our programs locally and abroad and join us. We need more than money; we need volunteers here to assist us to do our work.